A total solar eclipse lasts between two and three hours from the first nibble of the Moon on the Sun's disk to the end. This is the timeline you can expect to view during the Great American Eclipse of August 21, 2017. From begin to end, the eclipse lasts nearly three hours (including the partial stages) if you are within the narrow path of totality. 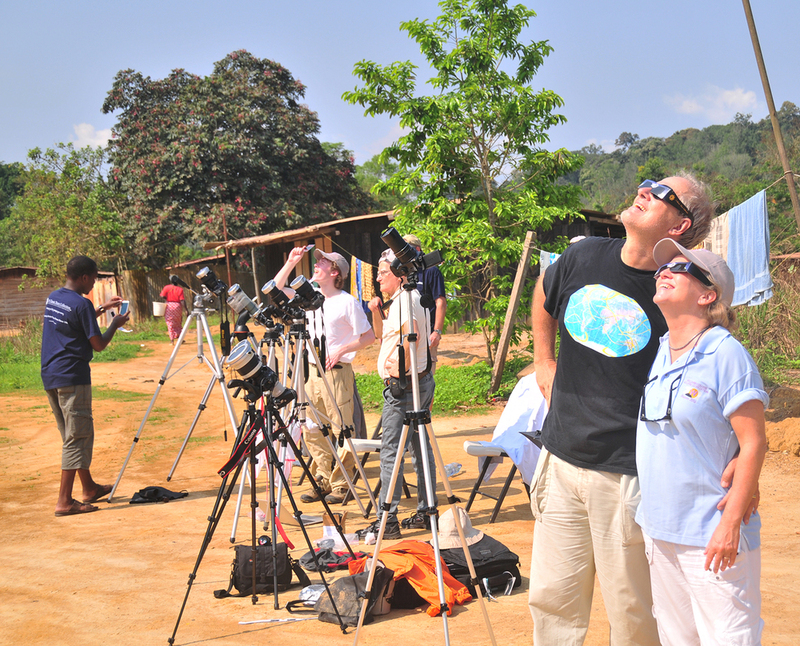 Safely viewing the partial phase of the solar eclipse with eclipse glasses in Gabon, Africa, November 2013. @2013 Michael Zeiler. When any part of the Sun is visible, do not look at the Sun without approved solar filters that are used properly. Do not assume that sunglasses, exposed film, CDs, or any other ad hoc filter is safe. Only use approved solar filters such as eclipse glasses from a reputable source. Failure to heed this rule may result in permanent eye damage. During the two minutes of the total solar eclipse, it is indeed safe to look directly at the Sun's corona with your eyes and through binoculars. But when totality ends and it suddenly brightens, instantly turn your eyes away and put your eclipse glasses or filters back on immediately. This is a chronology of the phenomena you may see during your moments under the Moon's shadow. First contact. This is the moment when the Moon first nicks the perfect circle of the Sun. Do not look directly at the Sun, but if you are wearing approved eclipse glasses, you will notice a bite on the Sun. For the next hour, this bite will steadily grow larger until the Sun becomes a narrow crescent. During this first hour, daylight will still appear bright and if you had not known of the coming eclipse, you might not have noticed anything amiss. But look at shadows cast on the ground from leaves of trees. You'll see an amazing collection of crescents that is the tell: an eclipse is in progress. 10-15 minutes before totality. Although the eclipse has been in progress for about an hour so far, there have yet been no obvious signs of what is about to come. But this will change quickly. You will start to see an eerie quality of daylight. It will diminish minute by minute and shadows are growing sharper. You will also start to noticeably feel the temperature drop. If it is a hot day, this will come as welcome relief. Start to watch animal life. Birds and other animals are frequently reported to noticeably react to the impending eclipse. What do you see? This video shows the elusive eclipse phenomena known as shadow bands in Australia, November 2012. @2013 Michael Zeiler. 1-2 minutes before totality. Your senses are starting to scream; something big is about to happen. Sunlight looks strangely different; not day and not night. It's a dim and diffuse kind of sunlight. The sky displays a gradient of colors, dark to the west and blue to the east. If you have a clear horizon, look to the west. You might see mountains or clouds in the distance turn dark. The Moon's shadow has met them and is coming quickly towards you. Look at the ground, especially white surfaces. You may see the elusive shadow bands which are sometimes seen just before and just after totality. Shadow bands flicker and dance and somewhat resemble the refractions of sunlight on the bottom of a swimming pool. Eclipser 1 -- stratospheric flight in Total Solar Eclipse http://www.stiintasitehnica.com/exclusiv-s-t-eclipsa-totala-de-soare-filmata-din-stratosfera-video_1695.html A Romanian-Australian scientific team successfully launched a stratospheric high-altitude unmanned balloon during the 14th November 2012 Total Solar Eclipse (TSE). Unique images and videos from the most spectacular astronomic event of the year were taken from the near out of space, along with very useful atmospheric data from the eclipse cone. In the very last seconds before the Sun is extinguished by the Moon, you may see the very thin crescent of the Sun (through your eclipse glasses) suddenly break into a thin string of beads. These are the Baily's Beads and occur because the last vestiges of sunlight are peeking through valleys and low points of the Moon's limb. The very last Baily's Bead lasts for only an instant and the breath-taking sight of this last tiny bit of sunlight along with your first view of the corona is called the diamond ring. Second contact, totality! Now the moment has come and it is unmistakable. For probably the first time in your life, you are standing under the shadow of the Moon. It is suddenly dark and there will be an audible reaction from you and others around you. If you have been wearing eclipse glasses, take them off! During the total phase of the eclipse, it is completely safe to directly look at the corona with your eyes and binoculars. Throughout the two minutes or so of totality, you will see something like a 360-degree sunset, brighter towards the north and south which are outside the path of totality. You'll notice darkening first to the west and as the eclipse progresses, the darkening moves to the east as the Moon's shadow rushes over you. Do not attempt to take photographs if this is your first total solar eclipse; you will be gobsmacked by the sight. Just soak in the magnificence of the spectacle and look at the corona and the sky. If you want to do photography, it's best to either start a video camera or still camera in time-lapse mode on a tripod before totality so that you watch totality without fiddling with your equipment. If you have a video camera or still camera in time-lapse mode on a tripod, set your lens on a wide-angle setting and try to include your family and friends in the view. Chromosphere and prominences. If you view the eclipse through binoculars (only when the Sun is completely blocked by the Moon! ), you will notice an innermost and irregular layer of deep red. This is the Sun's chromosphere. This is a shallow layer so it is mainly visible against the side of the Moon that has just been or is about to be eclipsed. You will also see what appear to be several licks of flame. These are solar prominences and their number and degree are variable from eclipse to eclipse. Stars and planets. The brighter stars and planets will be visible during totality. A bright star, Regulus in Leo, will be visible just to the left of the eclipsed Sun. Mercury is further to the left and Mars is to the right. Venus is a considerable distance away to the right but will be the brightest object in the sky besides the corona. In fact, Venus will be visible a few minutes before and after totality if you look in its direction. While it will be possible to pick out the brighter stars throughout the sky, don't spend the precious time doing so. Instead, concentrate your attention on the corona and the light show in the sky as the eclipse evolves. Third contact; end of totality. After about two minutes, the total solar eclipse will end all too soon. The end of totality will be marked by a second diamond ring followed by the Baily's Beads. Be sure to watch this only with your eclipse glasses back on. From this point, all the phenomena leading up to totality will play again in reverse order. Watch again for shadow bands in the first minute after totality if you didn't see them before. Look at the shadows from trees and see if you can see the striking crescent projections. When the eclipse is over, have dinner with your group and discuss the stupendous spectacle that you shared. Hug your family and friends and start making plans for the next US total solar eclipse in 2024. And hopefully, the young persons among you will be inspired by this event to take up the study of the sciences, come to understand our magnificent universe, and make a difference in our world.